For more than a half century hundreds of factories nestled in northern Italy's lush green Dolomite mountains, have made nearly 20 percent of the world's eyewear. 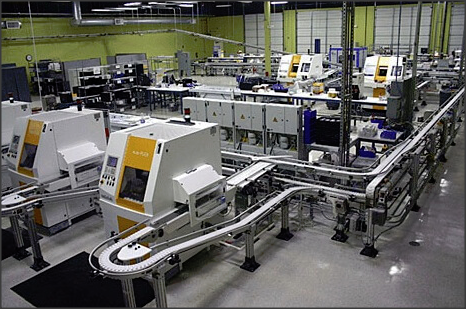 Some of the factories are small family shops, while others are large plants equipped with the latest robotics assembly lines. The area is considered the birthplace of the modern eyewear industry. 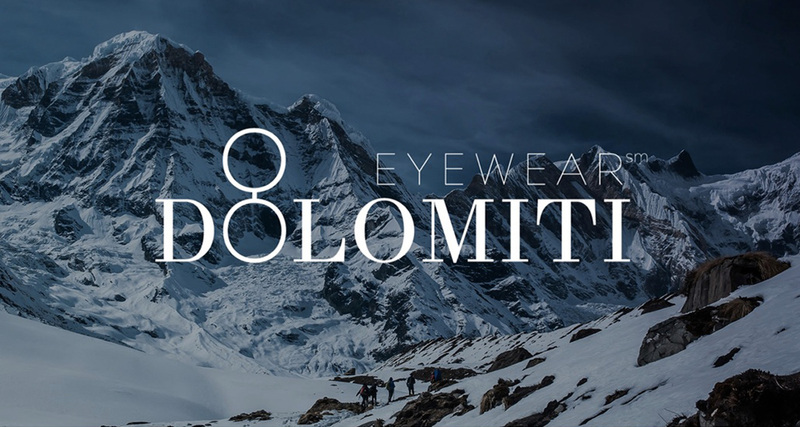 Our Dolomiti Round Eyeglasses Collection has been hand-made in this Dolomite Mountain region for nearly twenty years. Steeped in the Venetian decorative tradition, and the Northern Italian instinct for fine quality, our Dolomiti Eyewear frame designs stay true to their inspirational origins. Once considered the cumbersome sign of a handicap by the people who had to wear them, the rush for designer eyewear has changed forever the eyewear marketplace. Glasses have become highly fashionable. Looking at eyewear shape statistics, round eyeglasses are the first, most iconic, and most enduring of all glasses shapes. We chose the classic round glasses frame shape as the foundation for our Dolomiti Eyewear. The Dolomiti Eyewear brand includes round eyeglasses, round sunglasses, “almost-round” (oval) eyeglass frames, along with prescription lenses. These classic styles have a smooth design that have withstood the test of time. Oval and round glasses frames bring balance and harmony to the face. Our Dolomiti round glasses and Dolomiti classic oval eyeglasses are simply the finest quality round glasses available. Our Dolomiti frames are made with Alpaca, an alloy that is 82% copper, a metal many believe brings healing benefits to the body. Every component of the Dolomiti frame is 100% made and assembled in Italy. Each frame is coated with 20 layers of Swiss shellac, which provides a durable hypoallergenic barrier. The eyeglass frames are available not only in skull and polo style temples with spring hinges, but also with cable temples. All temples are interchangeable, so you can special order any combination of frame front and temple. Peruse our expansive selection of Dolomiti round eyeglasses to find the perfect eyeglasses frames for your face shape and life style. Of all the shapes of eyeglasses worn by individual as seen in photographs, drawings and paintings, the round shape is the first, most iconic, and most enduring. The earliest known images of eyeglasses worn by figures in paintings or actual artifacts were all round. Whether the shape choice was due to observing a natural phenomenon such as when a bead of water or small pool of water lands on something, it automatically forms a round shape or the glass globes or that the bottoms of bottles fill with some water people peered through to read magnified print were circular, we will never know. But humans are clever, curious people and through experimentation, trial and error found methods to help magnify objects. One person who figured out a rather novel way to read was a Roman philosopher, statesman, and dramatist by the name of Seneca, (c.4 BC - AD 65) who described actual magnification by a globe of water. "Letters, however small and indistinct, are seen enlarged and more clearly through a globe of glass filled with water." At the time this would have been a fairly simple, yet accessible method. Another means of magnify words was the use of a smoothed chunk of quartz or glass moved slowly over each word on a manuscript. However, the true inventor of eyeglasses will probably never be known, although there are many people in history who claim to be the inventor of round eyeglasses. One well known historical person who claimed this mantle was an English Franciscan philosopher and educational reformer, Roger Bacon (1214-1294) who was a major medieval proponent of experimental science. Roger Bacon made the earliest recorded comment on the use of lenses for optical purposes in his 1267 “Opus Major”, a treatment of mathematics and optics, alchemy and astronomy, that: “lenses will prove to be a most useful instrument for old persons and all those having weak eyes, as they can see in this manner the small letters…”. But magnifying lenses inserted in frames were already used for reading both in Europe and China at this time. Historians still debate whether the West learned about magnifying lenses from the East or vice versa. Eyeglasses first appeared in Italy. Their introduction is attributed to either Alessandro di Spina of Florence around 1282 and/ or Armati from Florence between 1285 and 1299. Scholars are more certain about the location in northern Italy, perhaps Venice, where these early spectacles made from wire and lenses first appeared. In Venice it was known that rock crystal, when shaped into strongly convex shapes, aided a reader’s vision. These “lapides ad legendum”(stones for reading) are even acknowledged in the Capitulary which governed the Guild of “Crystal Craftsmen.“ Such magnifying lenses were often simply placed over the object itself. Other magnifying lenses were set into bone, metal, or leather frames, and connected together to form an inverted “V” shape that could be balanced on the nose. 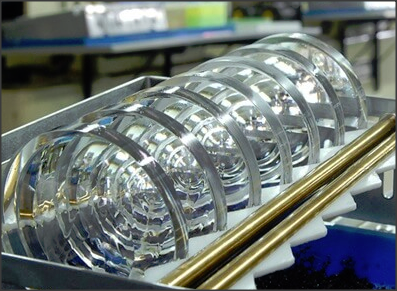 Originally, lenses were made of transparent quartz and beryl. Referencing what happens when a drop of water hits a surface, glass makers in Italy used a drop of molten liquid glass in a similar way. 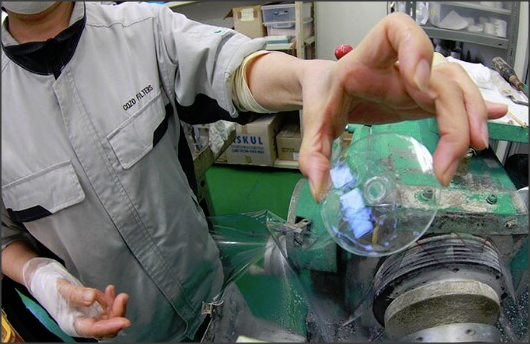 A glass drop forms into a disc naturally, and then hardens. 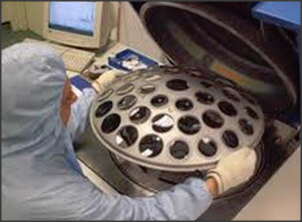 The disk was used to make the magnifier lens. 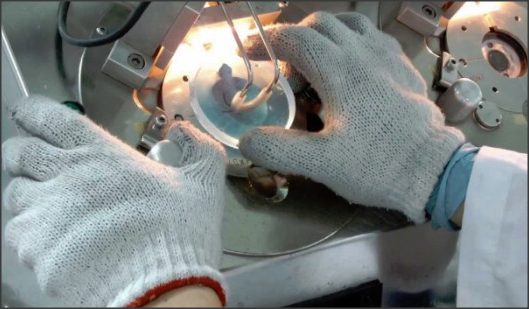 The strength of the magnifier could be adjusted by making the glass hotter and therefore less subject to surface tension, and hence flatter when dropped. Less-flat glass disks magnify less, and thicker glass disks magnify more. 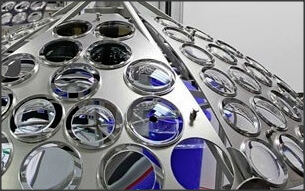 Experimentation around this phenomenon led to advances in lens design, but always in the round shape. 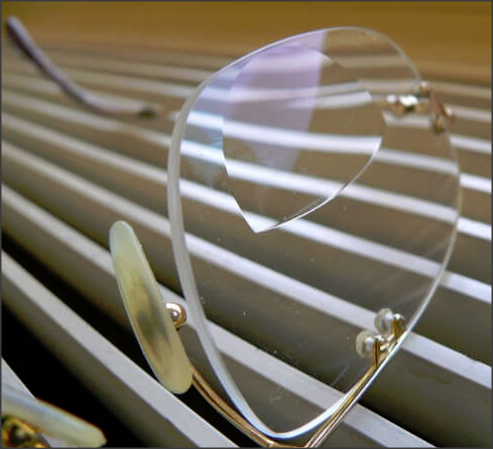 It wasn’t until the 20th century when technology advanced to the point that glass lenses could be cut into different shapes to accommodate fashion trends. With the invention of printing, books became available to many more people. Consequently, the demand and popularity of spectacles rose exponentially. One of the first portraits to show eyeglasses is of Hugh of Provence painted by Tommaso da Modena in 1352. In 1480 Domenico Ghirlandaio, an early Renaissance painter of the Florentine school noted for his detailed narrative frescoes painted Saint Jerome in His Study where a pair of oval glasses can be seen dangling over the edge of the desk. The earliest glasses had convex lenses to aid those who were farsighted. Later, round glasses with concave lens for nearsightedness (myopia), were developed as is evident in the 1517 portrait of Pope Leo X painted by Raphael. Supported by the ophthalmology studies of the seventeenth century, the design of both glasses frames and lenses steadily advanced. 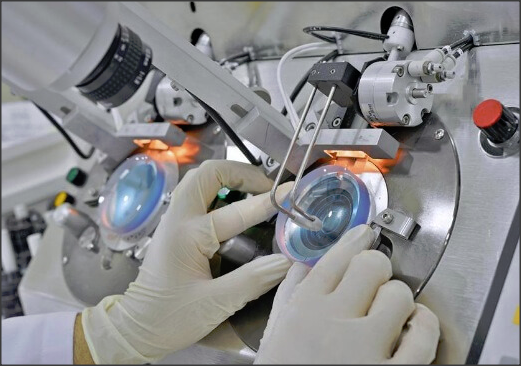 A Portuguese notary, Deça de Valdes, was the first scholar to separate and order the lenses according to their corrective power. In 1623 he assembled a scientific table of lenses. His work,” Using lenses for all kinds of sight problems” was ahead of its time. In 1784, the America statesman and inventor, Benjamin Franklin invented bifocals. He brilliantly designed divided lenses; one for distant and the other for near vision. The split lenses being held together by the frame. Cemented bifocals were invented in 1884, and the fused and one-piece types followed respectfully in 1908 and 1910. Throughout the nineteenth century the most popular eyewear was the “pince-nez“ developed in the 1830s with oval / round lenses. There were no side-arms and consequently the stability on the nose depended entirely on a spring support of the bridge. As technology advanced trifocals and new designs in bifocals were later introduced. By the end of the nineteenth century glasses were considered as an expression of style and personality and in some circles were among the most important accessories to be owned. The round shape, we call a circle, has been adopted in every conceivable domain of human experience ranging from money and art, architecture and religion, to fashion and round eyeglasses. The shape remains as prevalent today, as it was in prehistoric times. A preference for circular shapes is deeply ingrained in all of us from birth. Over the last century, researchers on human perception have tried to explain our innate propensity for circular and curvy shapes. In a remarkable paper published in 2006 in Psychological Science, cognitive psychologists Moshe Bar and Maital Neta conducted an experiment. Fourteen participants were shown 140 pairs of letters, patterns, and everyday objects, differing only in the curvature of their contour. The results were not completely surprising to the cognitive psychologists. Participants showed a strong preference for curved items in all categories, particularly when it came to real objects. Most of the research in this area seems to point out a self-evident truth that humans prefer shapes and objects that evoke safety which have rounded edges. Most humans are not as fond of objects with sharp angles and pointed features, since they suggest threat and injury. In nature consider human’s reactions of danger or caution to thorns and spines found on plants or trees, the sharp teeth of an animal, or the jagged, potentially cutting edge of a rock. There are two evolutionary explanations for our round-shape proclivity. 1. The circle, as the ultimate curvilinear shape, encompasses all of the attributes that attract humans: a safe, graceful, gentle shape that evokes peacefulness, calmness, and relaxation. Think of the shape of one’s mouth when chanting om during a yoga class, although one should recognize that its significance extends far beyond any yoga class. 2. The second explanation for our round-shape proclivity is rooted in the idea that human faces and their emotions can be expressed with simple geometric shapes. Consider the number of expressions that are represented by the very simple configurations of emoticons. The Round Circle is a Common Shape Seen Over and Over Again in Nature, as well as in All Cultures. There are many categories of round objects, some spherical and some flat. Some of the oldest and most enduring round shapes are the depictions of the sun and the moon. The flat round shape of the sun and moon have been immortalized in art and architecture for thousands of years. Depictions of the sun are always round while depictions of the moon are either round, or crescent shaped. Sometime around 500 BC in Greece, Pythagoras first proposed that the Earth was round. Pythagoras reasoned that if the Moon was round, then the Earth must be round as well. A century and a half later, Aristotle put forward what was likely the physical evidence that the Earth was spherical. Maps were designed to reflect this and round globes were designed and built to show in better perspective the placement, size, and shape of the continents. If you look around, you will discover many round or spherical shapes. Just look in a mirror. A close up of a human eye reveals that the pupil is almost a perfect circle. Humans, like many vertebrates that are mainly active during the daytime, have round pupils that are designed to be effective in bright light. Everything in nature tends towards stability by reducing its entropy or randomness. The circle, disk and sphere are the most stable shapes in their respective dimensions. Gravity is responsible for the round shape of celestial objects. In the absence of gravity or any other shaping force to act on objects tend to occupy the maximum area or volume possible. And, it turns out that the circle has maximum area of all shapes for given dimensions. Nature likes round and spherical shapes. The closest thing to perfect circles in nature is probably circular wave patterns on a pond or puddle after a raindrop falls on it. When a noncircular object is thrown into water, the resulting ripples will eventually form in concentric circles. In the cross section of a plant stem, the vascular tissues that conduct water and support the plant are arranged in circles. A great example of this is found in a cross section of a tree. The many concentric round rings seen in the tree truck’s cross section can be counted to determine the tree’s age. Flowers are also great examples where nature has created “round”, circular or spherical flowers. Consider flowers such as dandelions, daisies or asters that have outside petals arranged around their centers. Or the spherical Dahlia or Allium, with its bulbous, globe-shaped flower head. Many flowers have this symmetry and when drawn in a simple style they all appear round. The natural world is full of round fruits and vegetables. For example: apricots, blue berries, oranges, grapefruit, limes, melons of all kinds, beets, tomatoes, Brussel sprouts, peas, cabbages, and many others. And when these fruits and vegetables are simplified in a drawing they all appear round. If you add circular cross sections of bananas, cucumbers, carrots lemons, potatoes, zucchini, eggplants etc., you have an even longer list! Through the centuries man has used the circular, spherical, and round shapes that are found everywhere in nature, as inspiration for man-made objects. One of the most revolutionary inventions was the wheel. Take a look around, and you will see wheels everywhere. Every car has round tires. Today there are thousands of different types of wheels, ranging from tiny to huge found in all types of machinery, from wrist watches to space ships. The birthplace of the wheel is said to be either in Mesopotamia or the Eurasian steppes. The early wheels found in Mesopotamia were not even used for transportation, but are believed to have been first used by potters, with the use of wheels for transportation happening hundreds of years later. Often, round man-made objects were created because it was simply more efficient. For example, one of the most recognized round items is the coins. Used for thousands of years for trade, coins are frequently round in shape. Why? Some believe that the earliest coins were originally round for a practical reason: a drop of molten metal formed into a round shape naturally. Thus its stamp was designed to be round as well. 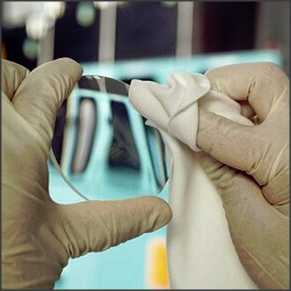 Early eyeglass lenses were designed in a round shape for a similar reason. Molten glass forms a drop naturally that when placed on a flat surface, that spreads out into a disk shape. Many ordinary house hold objects have a round or cylindrical shape. Some examples are, jars for jams and pickling, drinking glasses, toilet paper, plates, rings, medallions, vinyl records and compact discs, umbrellas, AA, AAA, AAAA batteries, clocks and globe light bulbs. There are other man-made items that are round in shape so they will function better. For example, manhole covers,are round so they don’t fall into the hole. Buttons are round to make them easier to slip into the slotted hole. Pens are round because they feel good in the fingers that way. Eyelets in shoes are round to make it easy for the shoelace to slide back and forth without fraying. Because a round shaped ball is more aerodynamic, you can find many examples in sports where a round spherical ball or round disc is used: baseball, basketball, soccer, tennis, lacrosse, field hockey, squash and racquetball, bowling, pool, bocce, croquet, cricket, golf, wiffle ball, ice hockey, discus, ring toss, the list goes on. The round shape is so basic, so prevalent in nature, so old, and so common, that many of the most important spiritual symbols have a round shape or encompassed in a round frame. The ancient symbol known as the Circumpunct, dot in the circle, circled dot, circle with a point, is one of the oldest symbols known to humans. According to Gnostics, it is the most primal aspect of God. To Greek philosophers and the Pythagoreans, the Circumpunct represents God, or the Monad, the point of the beginning of creation, and eternity. It is the Keter of the Kabbalah; the alchemical gold of the alchemist; and the sun of astrologers and astronomers. A mandala is a spiritual and ritual symbol which means “circle” in the Sanskrit language Most mandalas are either round, or square in shape with a large round shape in the middle. Common to the Hindu and Buddhism philosophies, a mandala usually represents the universe. and is a graphical representation of the balancing forces of light and dark, negative and positive, male and female, etc. These forces may seem to be contrary, but in fact are complementary and interconnected, showing how they both are required in the natural and spiritual worlds in order to be complete. The Yin/Yang symbol is prevalent in the Taoist philosophy and also in Confucianism. Sefirot meaning emanations, are the 10 attributes/emanations in Kabbalah. One diagrammatic representation called the Iggulim-Circles depicts the sefirot metaphorically as successively smaller concentric circles, radiating inwards from the surrounding Divine Omnipresence. The two most obvious, and well-used, round symbols are the number zero, and the letter “o”. The number zero represents the absence of quality, quantity, or mass, the cosmic egg, whence come all things. Zero implies freedom from every limitation, the boundless, infinite, past/present/future, and “Superconsciousness”. The left side of the Zero implies Involution(descent) and the right side implies evolution(ascent). Recognized as a holy letter in Qabala, the number zero represents “All the power that ever was or will be is here now.” The Wikipedia page for the number 0, is a fascinating read. The letter O is a breathy letter and requires the mouth to be formed in the shape of an “O”. It is the 15th letter of the English alphabet, and has been in the Latin alphabet since Phoenician times, about 1000 BC. It is the fourth most used letter in the English alphabet, but in the Phoenician alphabet, it was called “eyn” which means “eye”. The solar symbol is the circle with the dot. The "sun cross" or "solar wheel" (a cross within a circle) is often considered to represent the four seasons and therefore the Sun. In the prehistoric religion of Bronze Age Europe, crosses in circles appear frequently on artifacts identified as cult items. Most ancient solar symbols tend to be circular in nature. In modern times, this ageless symbol has been used by one of the world’s largest retailers, Target, as their logo. In the 1950s the "peace sign", as it is known today, a circle with a bisecting vertical line and an inverted “v” at the base, was designed by Gerald Holtom as the logo for the British Campaign for Nuclear Disarmament, a group at the forefront of the peace movement in the UK. It was adopted by anti-war and counterculture activists in the US and elsewhere. The term "Kamon" refers to a crest used in Japan to indicate one's origins; that is, one's family lineage, blood line, ancestry and status from ancient times. Kamon is a unique culture and tradition you can find only in Japan. Many of the Kamon crest designs are circular in form. History abounds with references to the round shape, especially in auspicious situations, and situations with spiritual significance. For example, the Knight’s Table, or “Round Table” of King Arthur was built as a round table so no one could be seated at the table’s head. It was created to foster an egalitarian management structure. Everyone sitting at the round table had equal status. This was an exceptionally novel concept in the 11th century when the world’s infrastructure was based on feudalism and the ruler had absolute power. The round shape is universally associated with the sun, as well as with instruments measuring the sun such as the ancient Aztec sun stone a circular disc. The sundial is a device that tells the time of day by the apparent position of the Sun in the sky. Its design consists of a flat plate (the dial) and a gnomon, which casts a shadow onto the dial. The earliest sundials known from the archaeological record are shadow clocks (1500 BC) from ancient Egyptian astronomy and Babylonian astronomy. Stonehengeis a prehistoric monument in England consisting of a ring of standing stones, Is arranged in a circular / round shape. Most historians believe that it was used as an annual clock, timepiece, or sundial, in addition to holding religious significance. Archaeologists believe it was constructed from 3000 BC to 2000 BC. The surrounding circular earth bank and ditch, which constitute the earliest phase of the monument, have been dated to about 3100 BC. Millstones have been around since Neolithic times. They are almost always round. They are stones used in gristmills, for grinding wheat or other grains. In ancient days, millstones can be powered by either animals or people walking around in a circle, or by hydropower, where a flywheel with gears is used to power the turning of the stone. A traditional yurtor ger (Mongolian) is a portable, round tent covered with skins or felt and used as a dwelling by nomads in the steppes of Central Asia. They have been a distinctive feature of life in Central Asia for at least three thousand years since they have able to withstand severe weather. The tipi, a portable home that was important to Plains Indians with their nomadic lifestyle. Tipis are durable, provide warmth and comfort in winter and are cool in the heat of summer and stay dry during heavy rains. They could be disassembled and packed away quickly and reconstructed quickly when the Plains Indians needed to relocate. Inspired by the symbolism of the circle and the sphere, architects have been designing circular buildings since the ancient times. Round towers and spherical domes have been used notably throughout the Greek and Roman times. The Roman amphitheater has been used continuously throughout the centuries to host shows and games: gladiator fights during Roman times, tournaments in the Middle Ages and from the 18th century until the present day the arena is the setting for Verona’s spectacular opera performances. Below are some examples of ancient architecture with round, circular shapes. 1. Leptis Magna Arena Not truly round but more oval, the Roman amphitheater of Leptis Magna dates from 56 AD. It was capable of seating 16,000 spectators. 2. The Rotunda of Galerius, now the Greek Orthodox Church of Agios Georgios, was better known as the Church of the Rotunda (or simply The Rotunda). The cylindrical structure was built in 306 on the orders of the tetrarch Galerius. It was either intended to be his mausoleum or perhaps a temple. 3. Amphitheatre Nimes Another oval shaped amphitheater, it was built at the end of the 1st century AD to seat 24,000 spectators. The Arena of Nimes was one of the biggest Roman amphitheaters in Gaul. 4. Pantheon The Pantheon was built in 126 AD as a temple for all the Roman gods. The temple has served as a Roman Catholic Church since the 7th century. The Pantheon consists of a large circular portico with three ranks of huge granite Corinthian columns. The portico opens into a rotunda which is topped with a concrete dome with a central opening: the oculus. Almost two thousand years after it was built, the Pantheon’s dome is still the largest unreinforced concrete dome in the world. 5. The Colosseum in Rome is the largest perhaps the most famous monument in the Roman world. The construction of the amphitheater was started by emperor Vespasian of the Flavian dynasty in 72 AD, finished in 80 AD by his son Titu. The Colosseum was capable of holding some 50,000 spectators who entered the building through no less than 80 entrances. 6. The Oculus was first used by Romans and can be most spectacularly seen in the Pantheon. An oculus is simply a single round window. It symbolizes monotheism – the belief that there is not many buy just one “all-seeing” eye. The Pantheon is the first example of the transition from the poly to the mono theistic view of the world. It was built during the time of the Roman Empire when Gnosis (pre-Christianity) was taking hold and infiltrating the world of Greek and Roman gods. The Oculus design was also utilized again in Renaissance and Baroque architecture as a feature to remind worshippers of the Oneness of God. The concept of the dome was taken up again in the Renaissance, and expanded as architects sought to make the domes higher and higher to foster inspiration in visitors. The dome is normally either round, or many sided which gives is the impression of being perfectly round. In Russia they developed the onion Dome construction. The best known example is the Cathedral of Vasily the Blessed, a church in the Red Square in Moscow, Russia that is commonly referred to as Saint Basil's Cathedral. The dome later evolved into other manifestations like the Tower of Pisa, which was essentially a round column, and Albert Hall, a great example of Neo-Classicism. One example of round in utilitarian use is the Round Barns built in the last couple hundred years. In modern times, construction materials and methods evolved and created new opportunities for expressing the round and spherical shape. Consider the Ferris Wheel,(https://en.wikipedia.org/wiki/Ferris_wheel)which was invented in the late 1800’s and has been in constant use at carnivals since then. The London Eye is a giant Ferris wheel on the South Bank of the River Thames in London. The structure is 443 feet (135 m) tall and the wheel has a diameter of 394 feet (120 m). When it opened to the public in 2000 it was the world's tallest Ferris wheel. The Ericsson Globe, Stockholm, Sweden. The Ericsson Globe is the largest hemispherical building on Earth and took two and a half years to build. Shaped like a large white ball, it has a diameter of 110 metres (361 feet) and an inner height of 85 metres (279 feet). It has a seating capacity of 16,000 spectators for shows and concerts, and 13,850 for ice hockey. The Guggenheim Museum, New York City, USA. Designed by Frank Lloyd Wright, the cylindrical building, wider at the top than the bottom, was conceived as a "temple of the spirit". Its unique ramp gallery extends up from ground level in a long, continuous spiral along the outer edges of the building to end just under the ceiling skylight. The Guangzhou Circle, Guangzhou, China. The doughnut-shaped Guangzhou Circle is located in the Chinese city of Guangzhou. A circle with a 50-meter diameter punctures the heart of the 33-story structure, turning the building into a hollow circle. When reflected in the river, this shape becomes a figure of eight - a lucky number in Chinese culture. The Radisson BLU Hotel in Frankfurt is a stunning architectural structure completed in 2005. Designed by architect John Seiffert, the disc structure is made of glass and features cubes of structural elements between the front and rear facades. The Marina City, Chicago, USA. complex was designed in 1959 by architect Bertrand Goldberg and constructed between 1961 and 1968. When finished, the two cylindrical towers were both the tallest residential buildings and the tallest reinforced concrete structures in the world. The Al Dar Headquarters, located in Abu Dhabi, looks like a coin standing on its edge. It is comprised of two circular convex shaped facades linked by a narrow band of indented glazing. Well, you get the point regarding round shapes. Round is the most prevalent of the basic shapes found in nature. Its circular shape is found in cultural references back to prehistoric times. Don’t think of round as being common. It’s glorious in its simplicity. It is understandable why the Dolomiti Eyewear Collection offers round and almost-round lens shapes for its single vision, progressive, and sunglasses styles. For the majority of faces, round glasses and almost-round glasses are the most physically appealing and complimentary eyewear. Try out some Dolomiti Eyewear and discover the beauty of almost round and round eyeglasses.